The reunion committee would like to wish all of our classmates, a very Happy and Healthy Holiday Season!!!! Can you believe that in 2020 we will be celebrating our 55th Reunion from Newton High School? The committee is looking at ideas to celebrate this next milestone. We would like your input and suggestions. A survey will be sent out by the website. Please take the time to let us know your thoughts. The 4th of July has many meanings for many people. With parades, cook outs, family gatherings, a vacation day from work, a time to reflect on one’s life and appreciate the blessings we all have living in the USA. Many of our classmates were in the various services: Marines, Army, Navy, and Air Force to name a few. Each proudly served their time with various reasons of why they were involved. A few of our close friends served, some in combat in Viet Nam, some were stationed in other countries and some here in the USA. Service has been an honor and privilege to fight and protect our rights here in the United States. If I may speak for all… Thank You for your service! One classmate’s life was ended while in Viet Nam. 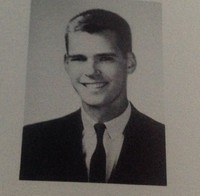 James “Skip” O’Neil from West Newton and a member of our Class of 1965 at NHS. I met Skip in high school. He was a lot like most of us trying to find our way through high school, making friends, girl/boyfriends and feeling you belonged to something. He had a great smile and you immediately felt comfortable being with him. We had a purpose for living. We were proud of our parents, siblings and pets. Never realizing life will not go on forever. Many of us are still here enjoying our lives at 70, 71 and 72 years of age. Our minds interpret how well we have succeeded, how we measure our successes in life, our marriages, in child rearing, friends, our loves. If Skip had made it home after his tour… what would his life had been like? His successes? His family? his loves? Unfortunately we will never know yet imagine a likeable guy like Skip would have been successful based on his experiences of fighting in a war in a foreign land. Many friends have once they return from war and appreciate the many blessings we are able to enjoy in the USA. To those special people we have been privileged to know… Thank You for your service. On July 4th please pause for a moment and think of your friends that served. They were important to your lives and many made a difference. somehow we knew we’d go our separate ways…we had completed a happy period sharing school together, learning how to cope, how to share, how to treat and be treated, perhaps our first love, learning how to cope with life’s various tragedies and victories, being a part of a group that shared peaceful and happy memories, learning how to get along, steps to growing, being a better person, various unique personalities shared, frustration addressing, learning to cope, sharing hope, avoiding dope, wanting life to remain carefree, playing together, parties, dances, first kisses, first cars, how to dress for acceptance, body functions and cleanliness, how changing weather changed our perspectives, attending games to share in or support others, not realizing the clock of life was constantly ticking, new avenues of getting a job, work requirements, having to move away from your secure environments, meeting new people, thoughts of friends that no longer were part of your daily existence, meeting that special someone to build a new life in marriage, have children and many times not realizing how blessed many of us are, sharing and caring, nurturing and guiding, passing on the lessons you’ve learned and seeing how they fit in yours and others lives. Noting how quickly time marches on, thankful for the moments both good and bad enabling you to learn and grow. Realization that your parents were guiding you, many doing the best job they could, welcoming a growing family as well as siblings offspring, seeing a unison of two growing into a blessed group and sharing new memories as the clock keeps pressing on. Isn’t it nice to revisit the memories you shared and loved so much? Seeing your now old friend’s and seeing them as you remember them when, not the balding, few pounds heavier, asking how their life is progressing, happy for their life impacting moments. Did high school leave you with bad memories? Was it really that bad or just at the time when we were growing and learning? Not quite sure and realizing the confidence within us. Some want to fly away and forget… some want to hold on and remember even if from afar. Understandable average only 20% will return to reunions. Some are unhappy with how their life has been, some feel inadequate seeing a classmate that had many successes, worried how the years have changed our teenage bodies and faces reflecting the many years, if after all these years you must realize the people you shared the best lives with are down deep the same as you and are happy to see you. How many relationships both female and male were important to you then and somehow the years, or lack of having commonalities kept you just beyond the reaching back to solidify a great friendship. They say you can count on one hand your true friends. Those that care are there for you no matter what, work at keeping the shared moments in life fresh and true. Facebook and Twitter enables this to easily happen. I can tell you the happy faces of those that do come home to catch up with lifelong NHS friends, sharing the atmosphere of us back in a time that was easy, no worries, no bills, have family dinner together, smile so much it gladdened my as well as all the attendees hearts. Understand it is a commitment and expense to come home again with flights and hotel expense. Physically many may not be able to attend, or those that don’t care to ever return… wish you well and thanks for the memories. Of those we have lost, sadly and too early… You touched our hearts in many ways sharing those precious high school days. You remain in our memories and our hearts. God bless you and yours! This was written by one of our classmates and submitted anonymously. Well done and is so true!! !